I have long held a fascination with trolls, those strange non-human creatures that live under bridges and come out when you least expect. They come out either as you approach the bridge or demand you answer impossible questions before they will let you cross or else they sneak out when you’re half way across the bridge and threaten to toss you over the side. 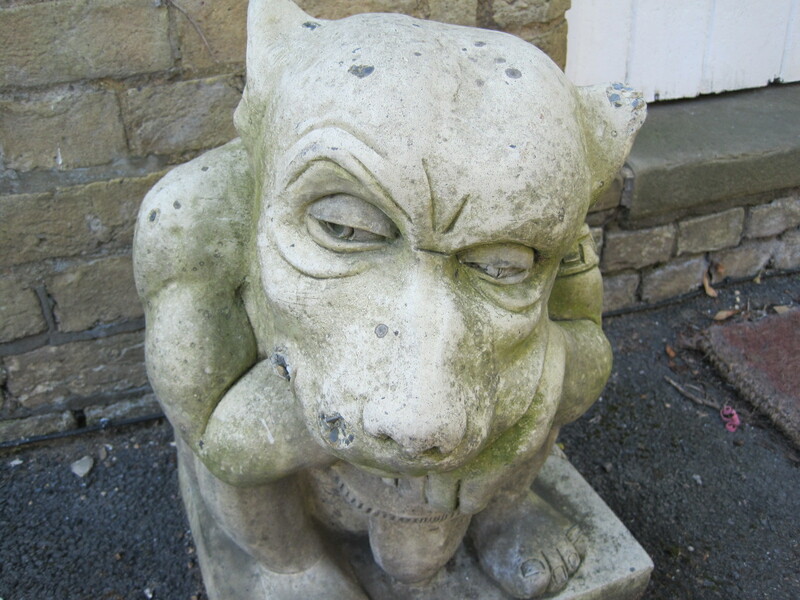 A Gargoyle, not a troll but almost as hideous. I dislike bridges almost as much as I dislike trolls, especially those bridges that are held in suspension over deep rivers or gullies. Bridges that sway with your every step and even worse still, bridges whose slats do not run evenly together such that you can see between them to the swirling waters below. I look between those cracks and can sense myself crashing to the bottom, engulfed in ice-cold waters even on the hottest of days, ready to drown. We went to the Maroondah Dam when I was a child and walked up the hundreds of stone steps to the top where the dam wall plunged down into gardens below on one side and on the other side held back the force of tons of water from the dam itself. 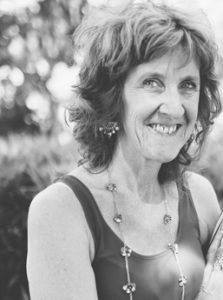 I sat beside my sister on the stonewall overlooking the slide to the bottom, and imagined my shoes – slip on shoes, which in Australia we call thongs – and imagined my shoes falling to the bottom. And somehow this forms my first memory when being high up left me fearful. Since then it is nothing for me to feel the sick jelly like roiling in my gut whenever I go to the museums in Melbourne and last year in Edinburgh, where there are floors that jut out on high and look down to the floors below. I steer away from these balconies and walk close to the walls. I avoid looking down for fear of falling. Always that fear of falling. Even when I am in a plane and the ground beneath my feet feels solid, I must stop my imagination from scraping away the floor at my feet, from scraping away the luggage hold, which I imagine to be one step below, from scraping away the thin layer of metal that protects the contents of the plane from the outside and imagine us without this casing, not floating in space, but ready to plummet down to the ground. 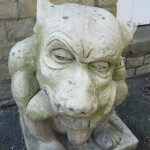 I hold no strong opinions on either trolls or gargoyles. They were not a part of my childhood. Nor really were bridges. Not the kind of bridges you’re on about. That said they weren’t places I chose to linger. You got across and did any business you had to do on terra firma. When I collect Carrie from the airport after her trips to the States we have to cross the Erskine Bridge, a multi span cable-stayed box girder bridge spanning the River Clyde. Visually it’s not a particularly exciting bridge to look at but it’s popular amongst the suicidal. I don’t mind crossing it—we get a taxi—but I’ve driven over it a few times and that terrifies me, the thought of losing control of my vehicle and plummeting over the edge. And the cars always drive so damn fast! I don’t like falling. Who does? As I get older—and I’m still not what most people would think of as ‘old’—I find myself becoming increasingly wary of stumbling or tripping. It’s so much a fear per se as it is an awareness. I don’t want to fall down. No one wants to fall down. Falling equals not being in control and I really don’t like not being in control. People talk about a fear of heights. Why would anyone NOT be afraid of heights? I’d go with healthy respect. If you don’t need to be more than two feet off the ground why would you? When my dad died it fell to me to wash the windows of my mother’s house—there is no way she’d pay anyone or let me pay anyone—and I detested the job even more than having to mow the lawn. For starters my dad’s ladders were probably about fifty years old. But I did my duty because we do our duty. They say you ought not use ladders once you reach fifty, unless you do so for a living, Jim. So ladders are well and truly out. But to your mother I suppose you were her young and agile son, never mind your fears. I agree no one wants to fall down and we are all prone to it from earliest days. I think of the startle reflex of babies. In the end, it’s hard to be human. Thanks, Jim. When I’m on a plane, I more than half-believe it is only being held up by what percentage of the passengers believe it is possible to fly. It is indeed amazing, Kass, that any of us have the courage to fly, but we do. I’m off again for a conference soon, in an airplane for the day and most of the time I don’t let myself think on it, otherwise it becomes what I consider to be wasted worry, but it’s there nevertheless. Thanks, Kass. Oh! How vulnerable we all are. And how we must trust such a creation as an aeroplane, or a piece of engineering like a stairwell because, in reality, if it fails, there is so little between oneself and doom. I heard, this week, of the death of someone important to me. A death which turned out to be a conscious choice, in so far as the person imagined it to be. So many people are angry and distressed. I think of Icarus, was it he? fell to earth and revealed his deluded world. It takes so little to scrape away the mask. This is just so sad, Christine, to think that someone should decide it’s all too much, while the rest of us can only stay behind and grieve.